We’re at the start of a revolution that will transform our lives as radically as the computer revolution of the 70s. The biological revolution will touch every aspect of our lives: food and health, certainly, but also art, recreation, law, business, and much more. 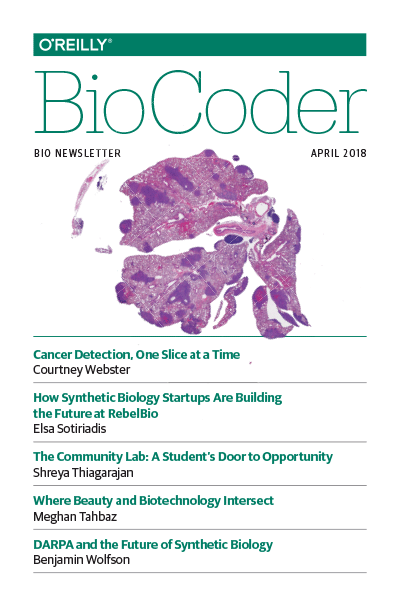 BioCoder is the newsletter of that revolution. It’s about biology as it moves from research labs into startup incubators, hacker spaces, and even homes. It’s about a very old programming language that we’re just beginning to understand, and that’s written in a code made up of organic chemicals. It’s the product of a sharing community of scientists that stretches from grade school to post docs and university faculty. @NinaDiPrimio is a scientist at a startup focusing on high throughput therapeutic discovery for orphan diseases using model organisms. She earned her PhD in gene therapy, was teaching faculty for laboratory courses, and completed postdoctoral training in synthetic biology. When not at the bench she is thinking about viruses, how to make biology more accessible, and science education. @mikeloukides is Vice President of Content Strategy for O’Reilly Media, Inc. He’s particularly interested in programming languages, Unix and what passes for Unix these days, and system and network administration. Most recently, he’s been fooling around with data and data analysis, languages like R, Mathematica, and Octave, and thinking about how to make books social. © 2018, O’Reilly Media, Inc.